Being vegan to some people means eating lots of bread and tofu, but I just don't think that's the way to optimize a plant-based diet. Food has the highest health benefits when minimally processed. Dinner always seems to be the most challenging meal of the day for me, creatively speaking. Breakfast is easy. Lunch is pretty simple. But dinner is the time that I make food for both me and the kiddo, so it has to be nutritious and delicious. On Sunday, I was really craving something fresh and pasta-y (made up words are so hard to get right!). I decided on tomato basil pasta with asparagus. 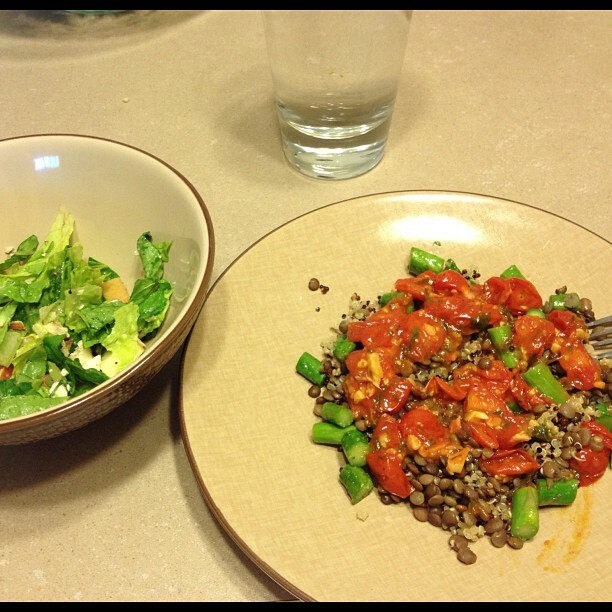 My mind guilted me about the pasta, so I booted it and substituted with quinoa ("keen-wa") and lentils. Then I topped with asparagus and homemade tomato basil sauce. 1. In a large sauce pan, heat a small amount of grapeseed oil on medium low heat (you can use olive oil, but make sure you keep it at a low to medium heat - more on this later). 2. Add tomatoes, onions, garlic, and lightly season with salt and pepper. Simmer until tomatoes have softened and sauce has thickened slightly. 3. Cook the quinoa and lentils as instructed on package. Set aside, covered. You can also add non-dairy cheese or parmesan. I served this aside a light salad: chopped romaine with apples, blueberries, nuts, and TesseMae's zero calorie, red wine vinaigrette dressing. A nice glass of white wine would go great with this;) Enjoy! !